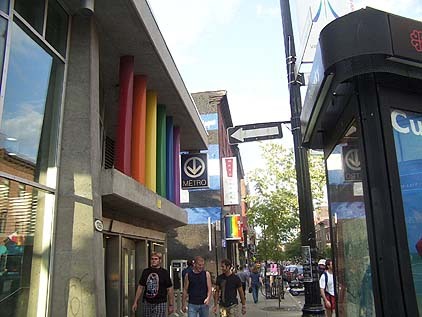 "The best selection to explore our community is on GAYroute.ca and it's all about Montréal’s gay scene. With hundreds of listings, it's even easier to connect with the right source from around the corner or completely on the other side of the planet..." Enjoy your trip, The SPY. Welcome to all the special circuit party participants and remember to play safe. Plus ask us about the many festival events in 2008 too ! A typical day at the Métro (subway) stop with our gay colours. So meet us here ok ! NB: We're updating this page regularly with new travel info and vacation ideas. AltaVista You know them as the internet's original search engine and their 100% Canadian too. Yahoo! Over 1 million sites divided into many categories c/w GAY browseable & searchable stuff. InfoSeek The GO Network is a site that brings together the best on the internet plus easy to use. Our Catalog Page ~ http://www.GAYroute.Info/ The perfect internet source for all of the latest details this great gay-friendly city has to offer ~ Since 1977 ! CityTourGuides.ca � ~ All Welcome ! Friendly services given in English or French for tourists & organized groups. DBL4DEZYN � Services Website construction & development specialists in Montréal ~ Since 1974 ! Buses ~ Metro (subway) The place to search all about Montreal's marvellous public transit system. Since 1984 - Montréal's gay room bookings & short-term lodgings service. In order to ensure an accurate review to all queries, your details provided may be shared with our personnel. We are currently not offering an on-line direct reply service. For any questions or concerns on the listed links, please consult each website for assisted help. Thanks. Please include the nature of the problem with all of the details. This includes any item or service offered in our listings. Thanks inadvance, The iñ•fö GAYroute.ca Directory Team. NOTE: We are providing you links to these applications as a courtesy and make no representation regarding the applications or any information related there too. Any questions, complaints or claims regarding any of the applications you see on this website must be directed to the appropriate website link operator or software vendor.